Extending from Panama, through Colombia, down to Northern Ecuador, the Chocó is one of the last coastal tropical rainforests on Earth. Conservation International recognizes it as part of 34 biodiversity hotspots worldwide. Collectively, these hotspots contain more than 50% of the world's plant species and 77% of all terrestrial vertebrate species in just 2.3% of the earth's surface. Located within the Chocó biogeographic region of Ecuador is a government reserve called the Cotacachi-Cayapas Ecological Reserve (RECC). 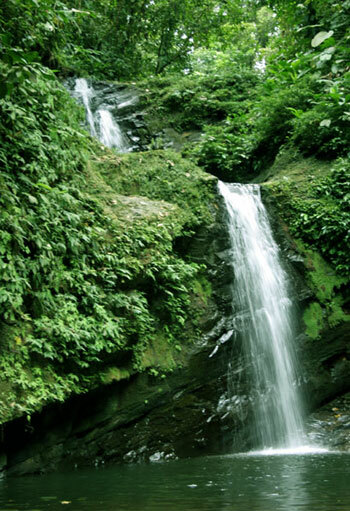 It was created in the year 1968 to help preserve Ecuador's part of the Chocó, known as the wettest spot on earth. Stretching from Imbabura to Esmeraldas Province, the RECC encompasses 204,420 hectares of land and 11 different life zones-more than any other protected area in Ecuador. Not surprisingly, the RECC and its buffer zone also boast an exceedingly high biodiversity: more than 2,107 species of plants and 1,178 species of vertebrates. There are 201 species of orchids recorded in the area, including 171 that are endemic. As many as 841 species of birds are believed to inhabit the area including 96 endemics. These birds Crax rubra, Ara ambiguous, Harpis harpyja and Penelope ortoni. According to Bird Life International, it is one of the most important areas in the world for endemism in birds. 124 species of amphibians and 111 species of reptiles are known in the area, among them, Caiman crocodylus. There are as many as 139 species of mammals, including the elusive Ateles fusciceps fusciceps. Although the area registers only 39 species of fish, all are endemic. Much of the RECC and its buffer zone are poorly studied and unknown. Many of the area's specialized habitats are found only in the buffer zone, and not within the actual boundaries of the reserve which include the areas that Touch The Jungle works in such as Playa de Oro and Intag. Unfortunately, the Chocó is also in great danger of disappearing. In the province of Esmeraldas alone, between 25,000 and 62,500 acres of primary Chocó rainforest disappear each year. The direct causes of this natural massacre are logging, mining, ranching and commercial farming. However, the roots lie in the poverty and lack of resources, such as quality education and healthcare, of the local people. This is one more reason why it is so important to promote environmentally friendly tourism in the Ecuadorian Chocó, before it is lost forever. Our goal is to attract resources to help these communities defend their territory and traditional lifestyles unconditionally, such as through community run ecotourism projects. At the same time, we hope that these efforts inspire other communities in surrounding areas to restore previously logged or mined land by participating in reforestation and wildlife re-introduction programs. With rapid Global Climate Changes, increasing world pollution and the growing scarcity of natural resources, people today are finally realizing the importance of conserving our Earth's natural areas. Though some may fear it is too late, we believe that it is everyone's responsibility to save and replenish what remains of such biological and cultural treasures. We urge you to help support our efforts to preserve the Chocó Rainforest and support the environmental efforts of the local peoples.